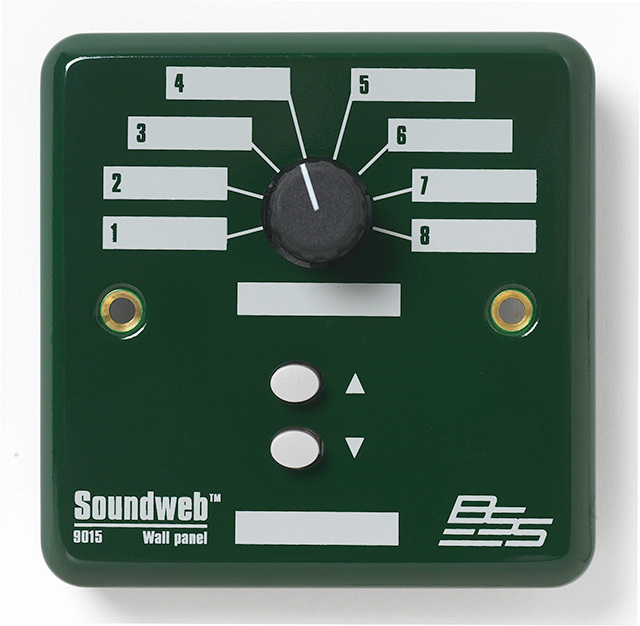 The Soundweb 9015 Wall Panel is a simple hardware interface to the Soundweb programmable DSP system. It provides a quick and easy way for designers to provide a pair of spin or 'up-down' buttons control and source or preset select (or other multiway switch function)in a standard UK-sized light switch panel fitting. These hardware controls can be used to provide local control of, for example, volume, source select, or parameter presets. Soundweb Designer software is used to 'map' these functions onto the control ports of a Soundweb device. Gain or Level type controls must be 'morphed' into spin pairs to be mapped onto the control ports. Connection is via screw terminal connectors. Four terminals are used for common, rotary switch output and the 2 up/down button outputs. The switch has blank ident areas for marking the switch positions, either directly onto the white area or on self-adhesive labels. Sets of 'standard' labels in 4 languages (English, French, German & Spanish) are supplied with the 9015 to cover most locational requirements. Please note: The 9015 is still available in a US-style single-gang light switch fitting, finished in beige to match many types of decor.